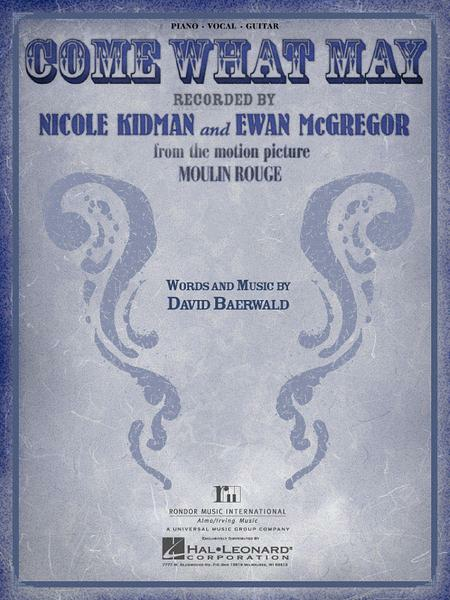 Come What May - From "Moulin Rouge"
By Nicole Kidman and Ewan McGregor. Piano Vocal. Movies and Pop. Single. With vocal melody, piano accompaniment, lyrics, chord names and guitar chord diagrams. 8 pages. Published by Hal Leonard (HL.352377). ISBN 149504081X. 9x12 inches. Key: C major. From Moulin Rouge) (Nicole Kidman and Ewan McGregor. 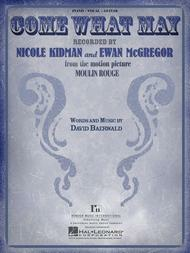 Preview: Come What May - From "Moulin Rouge"
a Beginner piece. The chords are advanced and the rhythm is advanced as well, particularly if you want to play it as a piano solo. I am a piano teacher, so my perception of levels may be a little different than others. 28 of 50 people found this review helpful. for a couple parts. Makes me feel good to be able to actually play this song instead of just listening to it. Loved the movie and even more the musical selection!! 26 of 56 people found this review helpful. end of the song. I may be a little picky (I am a music educator and arranger), but it could've been better. Unfortunately, this is the best published arrangement of the song. 27 of 53 people found this review helpful. The song is a good song, however too many chords were put into the sheet music. I became very board because it didn't challenge much. The only challenge would be stretching my fingers to reach the notes. 30 of 56 people found this review helpful.